Victoria Jamieson received her BFA in illustration from the Rhode Island School of Design. 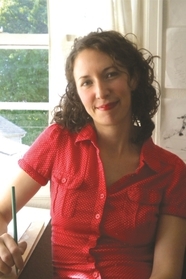 She worked as a children's book designer before moving to Portland and becoming a freelance illustrator. She has also worked as a portrait artist aboard a cruise ship, and has lived in Australia, Italy, and Canada. She maintains a not-so-secret identity as Winnie the Pow, a skater with the Rose City Rollers roller derby league. She is the author of The Great Pet Escape.